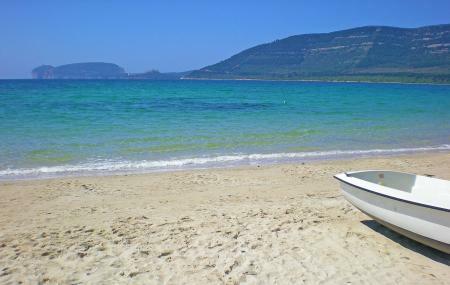 Several kilometers long, Spiaggia Mugoni is one of the finest beaches of Alghero forming a sweeping arc and covered with fine colored sand. Its white sand and emerald colored water that always remain cool and calm even in summer months like August, make the beach a favorable spot for families to hang out. The thick wood pine trees along the beach shelter the sea, beautifies the beach. Children find it safer enough to enjoy some time in the water. Tourists who prefer to spend more time in the place, stays by in nearby hotels. To explore the coast during waves, you can hire ‘patino boat’. Activities like surfing and wind surfing are also favored on this beach. Paid toilets and shower facilities are available on the beach. Closely located hotels are there if you plan for a night stay. Large car parking space is available where campers can park their camper vans. The beach has easy wheelchair access. How popular is Spiaggia Mugoni? People normally club together Neptune's Cave and Nuraghe Di Palmavera while planning their visit to Spiaggia Mugoni. A stunning beach on the western side of the island. If you’ve rented a car and been to Neptune’s Grotto during the day it’s a great stop to make before heading back to Alghero for dinner. There are plenty of bars along the beach offering water, beer, snacks and even dinner. There is a paid, private section to the beach with loungers and deck chairs so if you don’t want to pay do bring your own towels etc. The views of the cliffs and bays around the grotto and north of Alghero are really beautiful and it’s the perfect place for a dip or stroll in summer or early autumn. Amazing beach! Lots of parking, deep beach, long sands and a few bars/eateries to choose from and not overrun on a Saturday. Lovely views over the headland and a good breeze which cooled the sunbathe. We came twice Fri/Sat it was so pleasant. Best beach in the area imo. Yes gets busy, but walk down to your right when you get on the beach and your find a spot. Lovely sand, no stones, clear water, that's shallow then drops off. Good facilities all around 2.50 a beer. Parking 1 euro an hour, pay when you leave. My best beach in Alghero. Better beaches on other Coast. The best place to go with young kids. It's shallow water allow even toddlers to enjoy the water and the sand is great for castles. The restaurants have from the basic pasta to the diverse tiramisu. We're definetly coming back to this picturesque site.